when you have a showing at your house. Makes it more homey or something like that. Ya know, that smell is supposed to evoke feelings of yesteryear or something, make you think this is really a place you can lay your nest. I don't know about you, but Beth Weinblatt didn't bake bread too often, unless it came out of a bread maker, and that phase didn't even last too long. But whatever. At this point, I'll do anything. And so I baked a bread. 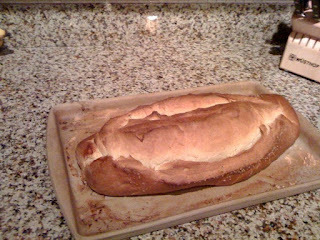 I googled, "Easiest possible bread recipe" and made that. It didn't sell the condo. It smelled pretty good, but didn't sell it. Anyone else have any old wives tales or superstitions to recommend? We'll do anything. Or if you know someone who would like to buy a beautiful condo in an excellent building in Minneapolis, that would be much preferred. As fun as it is to kneed bread for hours at time, I'd really just like to sell the place. From now on I'll stick to the break and bake cookies, my house growing up smelled like cookies much more often than bread. Ya know, that's how we roll. I haven't delighted you all with a poem lately, so here goes. You know you missed it! Yea, but the whole rising process smells good, and the long baking process. It smells good, but regardless, is absolutely not worth it. In the Catholic Church, St. Joseph, a carpenter, is the Virgin Mary’s husband and foster father of Jesus. Known as a humble family man, he is the patron saint of home, family, and housing-related needs. The origin of St. Joseph’s reputation as the patron of real estate varies, but one of the more popular stories refers to an order of nuns in Europe who were in desperate need to find a convent. As the story goes, a medal, depicting St. Joseph was buried while asking the saint for divine intervention. The nuns quickly found a convent! "The St. Joseph The WorkerHome Sales Kit"
Last year I paid $7.95 including shipping (this year it’s $8.95) for my St. Joseph. I placed my order with www.holyfamilycatalog.com and paid by credit card; surprisingly, the little kit arrived within five days. The demand for the Home Sales Kits is astonishing! If you search “St. Joseph Home Sales Kit” online, you will be shocked at the number of pages that come up listing the various vendors. My decisive factor was cost and shipping charges, and you’ll see the range from $1.95 per statues to about $29.99. What’s in the Home Sales Kit? ~ A beautiful four-inch, polivinyl resin statue, and it's hand-painted (according to the packaging) in pretty colors. ~ St. Joseph prayer card (made in Italy) that’s beautifully illustrated. ~ bury it next to the front door facing away from the home. Religious experts say there's no official doctrine that calls for the statue's burial, and according to Jaime Lara, associate professor of Christian Art and Architecture at Yale Divinity School, the practice may have stemmed from medieval rites of land possession, in which conquerors claimed land by planting a cross or banner. Faith and devotion are necessary, in addition to obtaining the saint’s statue; otherwise the practice amounts to little more than superstition or magic, according to Father Connell of the Boston Archdiocese. He also believes that out of respect, the statue should not be buried and instead it should be displayed somewhere around the house, placing it in a prominent spot. If you decided to bury your statue, custom dictates the statue should be dug up and put in a place of honor in the home. It’s imperative to mark the spot where you buried St. Joseph, and the first time I did it, I marked the burial location and finding St. Joseph was a cinch. The second time, however, I thought I knew where I buried him, but to my dismay, I could not find him! Well...we actually already buried a St. Joseph. He's on our patio!!!! And I seriously believe in him - after we buried him we got like 5 showings! Found you through the "next blog" button.